(Saugerties, N.Y.) – Rip Van Winkle Campgrounds located in Saugerties, NY has recently scored a perfect 10 on Good Sam. Good Sam rates campgrounds 1-10 (10 being the best) on the quality of the facility itself and its overall appeal as well as other amenities. The Good Sam Club is an international organization of recreational vehicle (RV) owners and the largest organization of RV owners in the world. Its longstanding history and solid reputation gives RVers and campers alike valuable insight on what others are saying about certain campgrounds. The 160-acres of woodland that make up Rip Van Winkle campgrounds is home to nearly 200 campsites and several fun zones including an outdoor movie theater, swimming pool, R/C tracks, a game room, a rec hall, a driving range and a soft serve ice cream shop. Rip Van Winkle offers the luxury of escaping the everyday hectic day-to-day chaos while still providing modern amenities that make it necessary for campers to experience their utmost comfort. This family-oriented campground can attribute its roots back to its longstanding chain of familial history. 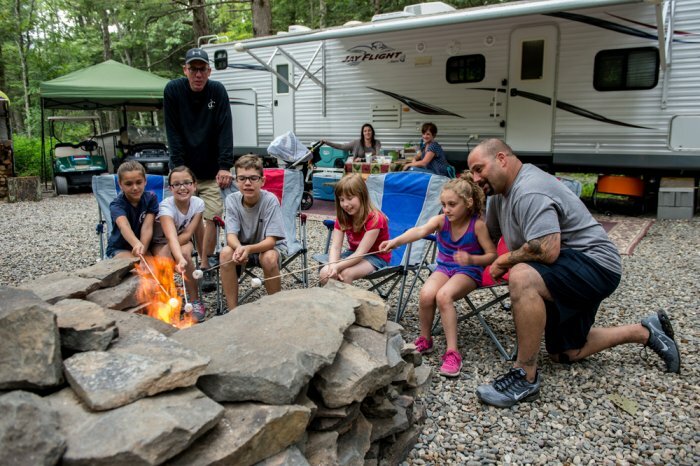 The third-generation campground is now run by the founders three grandsons who are currently in the process of priming the fourth generation to carry on the Rip Van Winkle legacy.